Sunshine bass are a hybrid species of hatcheryfish raised and introduced into the St Johns River by the State of Florida as a truly recreational species. 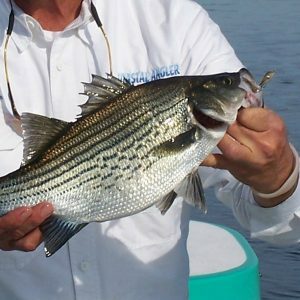 Sunshine bass are a sterile cross breed between a white bass and a striper and are available year round. It is not uncommon to catch sunshine bass while fishing for largemouth bass, using the same baits and tackle. Another species visiting our region in the winter is the striped bass. Striped bass prefer cooler water temperatures, but do visit our area during the winter months and can be caught using the same tackle and techniques utilized for largemouth and sunshine bass.